I'd love to see Nordic huts and houses that have grass roof like this. Nice. 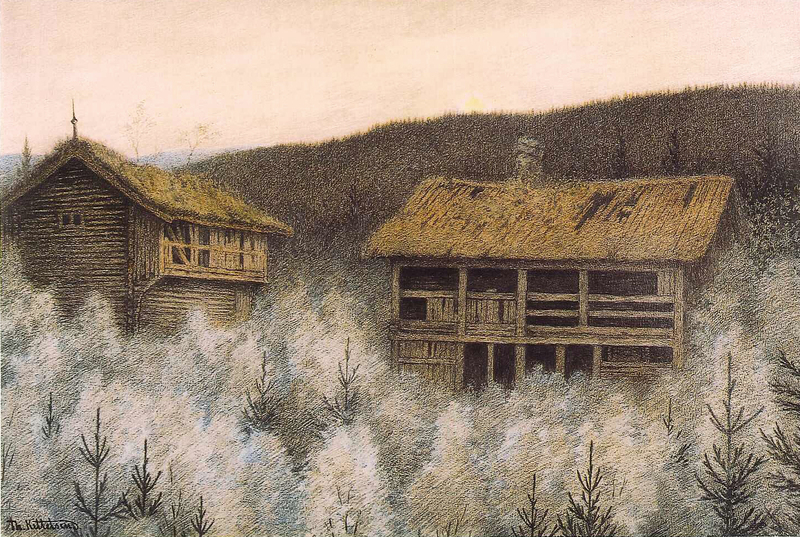 I hope we can achieve a Kittelsen vibe in some of the southern parts of Skyrim. Kittelsen has a lot of nice art of swampy terrains and rocky coasts as well, so i'd love to see his style in Hjaalmarch and Dawnstar holds. I'm at the moment writing a thread with Kittelsen art with some fluffy lore text to make it fit into the TES universe, but it seems that I can't make threads yet. - We were just talking on IRC about having some kind of "Frost-Dreugh" with frost resistance. Could use a similar mesh, texture would be a little more blue-tinted, maybe, and glowing eyes might be a neat addition. Thinking about the connection we can make to Morrowind... it would be a little weird to have all things native to Morrowind magically "disappear" as soon as you cross the border. Near Winterhold and Dawnstar may be a good place for them. Quote from Book Two of 2920, The Last Year of the First Era which first appeared in Morrowind suggest that Dreughs should be living anywhere from Morrowind through Skyrim, High Rock, Hammerfell to Valenwood and Summurset Isles coasts. In Daggerfall they had "low tolerance to frost" though. Also simple Word Walls should be found in tombs since they contain texts that give account of the buried. In our case they are not going to reveal words of power to the player though, since that gift is limited to Dragonborn. To reap the harvest of the unmourned house. to not be 100% true or have different meaning of "Dragonborn", well Gilvas Barelo thought it means just "born under foreign stars and the sign of the Dragon -- the Imperial sign". Is it weird that I want a vampire clan on Morthal?